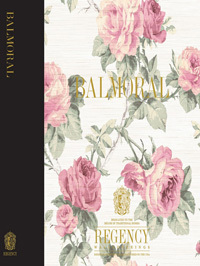 Find the best of traditional design in the new release from Regency Brand Wallcoverings in the new Balmoral collection. Classic design and timeless pattern reference are invigorated by color, scale and sheen, creating a collection of patterns suitable for the modern day Duke and Duchess. The influence of traditional English archival patterns is apparent in the luxurious motifs, over-scaled repeats and richly colored florals and damask patterns. 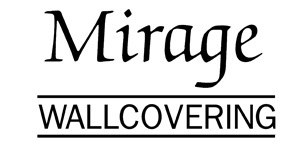 Reflecting the heritage of the great homes of Europe with their sweeping staircases, soaring ceilings and endless interior rooms, the patterns are reinvigorated for today's interiors of stately dining rooms, center halls and traditional living spaces. Collection highlights include the stunning “Balmoral” feature pattern, English roses combine with a pretty damask pattern and colored in light neutrals with pink roses, to a luxurious, deep blue ground damask with red roses. “Hyde Park” jacobean on a strie texture ground with a slight sheen suitable for many rooms in the home. A William Morris inspired pattern of intertwining leaves in a dynamic coloration of black, olive greens and deep pinks will create an unforgettable statement of design and pattern. Coordination throughout the collection consists of classic stripes, ceiling patterns of pretty floating clouds, and tonal jacquard style damasks.